Features sleek, chrome armrest with a removable footrest. Paris Hydraulic Styling Chair in Black Upholstery. Stylish, classically designed professional salon chair. 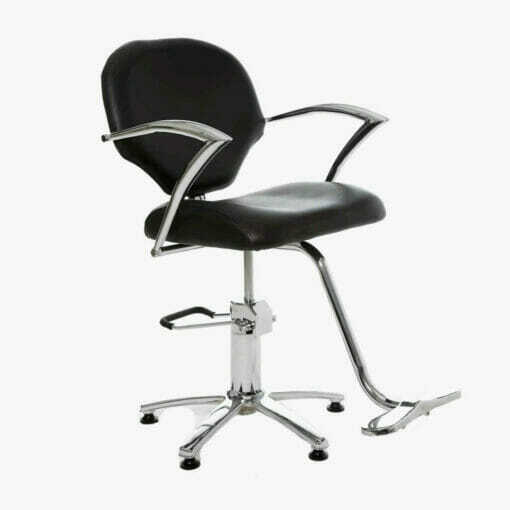 The Paris Hydraulic styling chair features sleek, chrome armrest. With a removable footrest. Manufactured in a hard wearing black upholstery, which is easy to wipe clean. Making this chair ideal for all hard working environments. From high street salons and barbers shops to colleges or nursing homes. This chair comes supplied on a chrome 5 star base with adjustable glides. The hydraulic pump gives an easy height adjustment using the foot lever. It can then lock into position to stop any unwanted movement or rotation during use. Practical, economical and comfortable. All at an affordable price! Dimensions: Height 59 – 78cm, Width 56cm, Depth 45cm, Depth including footrest 77cm. Paris Hydraulic Styling Chair. Supplied on a 5 star Base. In Black Upholstery. Professional Salon Chair.